Well, the Patient Freedom Act, as introduced, replaces ObamaCare with...ObamaCare. Yes, you read that right. The bill would allow states that maintain ObamaCare as it currently exists, including the costly regulations and Medicaid expansion; develop their own health insurance alternatives with "federal assistance"; or develop their own health insurance alternatives "without federal assistance." Before we go any further here, let's be clear: there is absolutely nothing that would prevent states on their own from adopting ObamaCare when it's repealed. That's really the beauty of federalism. Keep in mind that ObamaCare was based on the 2006 health insurance law adopted in Massachusetts under then-Gov. Mitt Romney. The law, of course, has largely been a failure, much like ObamaCare. Still, if a state wants to take that route, its lawmakers can do so without federal legislation like the Patient Freedom Act. There are several other issues with the Patient Freedom Act, as Philip Klein explained after the bill was introduced by Sen. Cassidy. "One reason it can't be seen as a legitimate choice is that the law keeps Obamacare's taxes and most of its spending in place (particularly, 95 percent of its subsidies) and keeps the federal exchange infrastructure intact. That means that even if lawmakers in one state choose not continue participating in Obamacare, their residents will still have to be paying to support the program," Klein wrote. "It also means that for the sake of inertia if nothing else, many states will stay within Obamacare." "Another reason it isn't a legitimate choice is that the law will continue to impose costly regulations at the federal level. Those include forcing insurers to cover those with pre-existing conditions, prohibiting annual or lifetime caps, requiring insurers to allow adults to remain on their parent's plans until age 26 (also known as the 'slacker mandate'). Whatever the arguments are for these policies, a system of choice would leave states free to impose such requirements, but other states free to pursue alternate market-based plans. Instead, under the Cassidy-Collins plan, any state that opts out of Obamacare would continue to be restricted by its regulatory tentacles," Klein added. 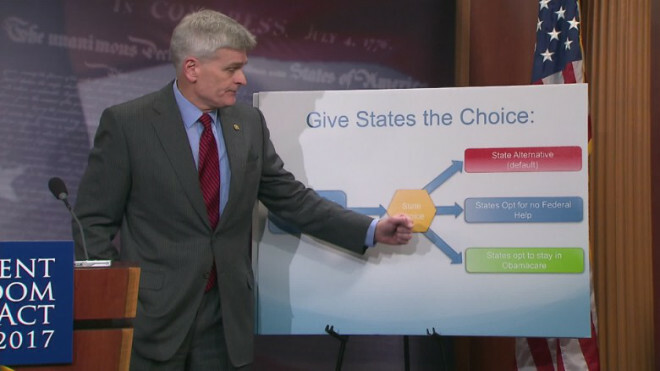 The goal of the bill, as Sen. Cassidy said at its unveiling, is to attract Democrats to strike a compromise on an alternative. "At some point in this process, we’re going to need a bill that can get 60 votes. We think that helps us get to 60," Sen. Cassidy told reporters. "California, New York: You love ObamaCare, you can keep it." Of course, no Democrats are listed as original co-sponsors, and to no one's surprise, Senate Minority Leader Chuck Schumer (D-N.Y.) dismissed the Patient Freedom Act. "Ultimately, this proposal is an empty facade that would create chaos — not care — for millions of Americans. Republicans should drop their disruptive repeal plans and work with Democrats to improve, not gut, the Affordable Care Act and healthcare system for all Americans," Schumer reportedly said in a statement. If Republicans are serious about repealing ObamaCare, they, you know, actually have to do it. Introducing a bill that effectively preserves ObamaCare does nothing to further this effort. Any replacement bill must repeal what remains of ObamaCare that can't be repealed through reconciliation, and it must promote policies — including expanded health savings accounts and block grants of Medicaid — that would truly give patients freedom. Moreover, any replacement should decrease the federal government's role in the health insurance system, not continue to meddle in it by creating a false narrative that Congress is doing something that states couldn't do before ObamaCare became law.